Happy Friday, everyone! Today I have a preview of the set School Days by C.C. Designs. I used some Provo Craft paper, gingham ribbon, black hemp twine and buttons to make this mini journal and bookmark. I colored the images with Copics. 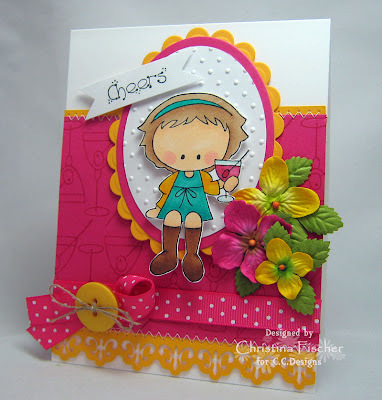 Be sure to stop by the All That Scraps Blog to see more previews of the new sets! All the new releases will be available Monday, August 3 at 10:00 pm! Tomorrow I'll have another pre-scheduled post, since I'm away at CHA! It's an All That Scraps preview of a CUTE new set! Thanks for stopping by today! Happy Tuesday, everyone! Here's another card I made for Dare to Get Dirty '09. I combined three challenges: PickleTree's Born to Be Wild challenge, StamperSharon's Black, White & Red challenge, and cindy_haffner's Sketch challenge. 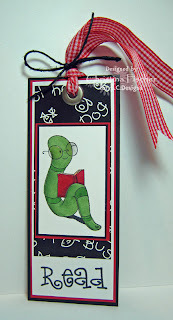 I stamped Flopsey on white cardstock and added just a little bit of color with Copics. I did some Cuttlebug embossing and machine stitching for some added texture. Well, I'll be leaving shortly for CHA!!! YAY!! I have posts scheduled while I'm gone, so be sure to stop by! I'll see you all when I get back! Happy Monday! Did any of you play in the Dare to Get Dirty Challenges over the weekend? 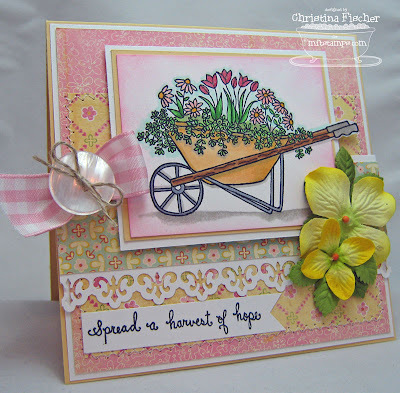 Dare to Get Dirty is Splitcoaststampers' way of thanking their Fan Club members, with challenges hosted by the Dirty Dozen and DD Alumni. You can read all about it HERE. There were several challenges posted each day! I wish I could have done all of them, but I had to settle for choosing a few! 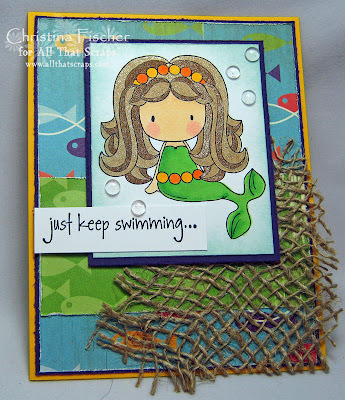 I made this card for Jen del Muro (genie1314)'s Tag Art challenge. 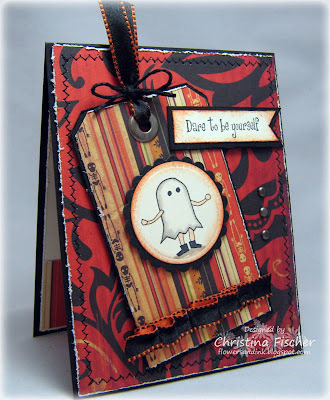 I thought this adorable Ghost would be cute paired with the sentiment from Inspirational Words, both from American Art Stamp. The paper is Haunted by Cosmo Cricket. I did some distressing, machine stitching, ribbon pleating and sponging. In a skillet over medium heat, brown roast in oil on both sides. Plase roast in a slow cooker, and pour tomatoes over top. Cover and cook on Low for 10 to 11 hours. About 15 minutes before serving, stir in mushrooms; cover and heat through. Serve with cooked egg noodles or mashed potatoes if desired. Makes 4 to 6 servings. I'm still scrambling to get things ready before I leave for CHA, so I have lots to do today! :) Thank you so much for visiting today -- I'm always glad when you stop by! Have a fantastic day -- don't forget to spend some time around the supper table! American Art Stamp is having a Web-a-Ganza sale ! 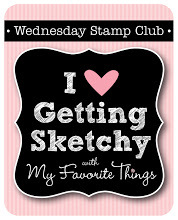 Most of the wood mounted and cling stamps are 25-35% off!! Prices are deducted when you check out, so you don't have to worry about any special codes. So, head over to American Art Stamp and take a look around, relax and shop ! Happy Thursday! This week's My Favorite Challenge is to finish your card Inside and Out. You may have noticed that more designers are finishing the inside of their cards -- it's a great way to kick things up a notch! My niece's birthday is next week, so I pulled out my beloved Flopsey and got to work on her card! I have many samples to work on for upcoming releases, so I need to get to work! I'll be leaving for CHA in just a few days, so I'm running out of time! 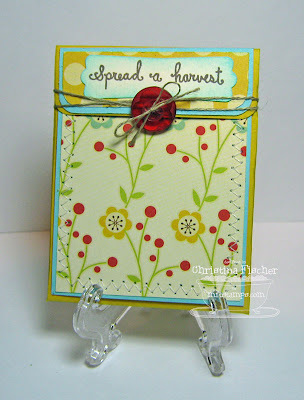 I hope you have some stamping planned for your day, too! Thanks so much for stopping by! 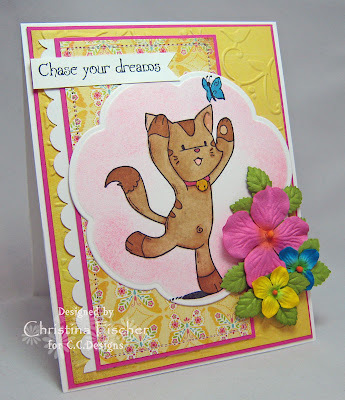 ATS Challenge: No Patterned Paper! Happy Wednesday, everyone! Another late post from me -- it's been another weird day! Our phone line and Internet went down last night, just before I was going to post this. The phone repairmen didn't get here until 2:30 this afternoon, and it was fixed in 5 minutes!!! Geez!! Anyway, I'm here with this week's All That Scraps Wednesday Challenge. This one was a tough one for me -- no patterned paper!! Yikes! I made my own patterned background with the martini glass image from Gingersnaps Celebrate!. I turned the martini into a Cosmopolitan, and I used my yummy new SU! 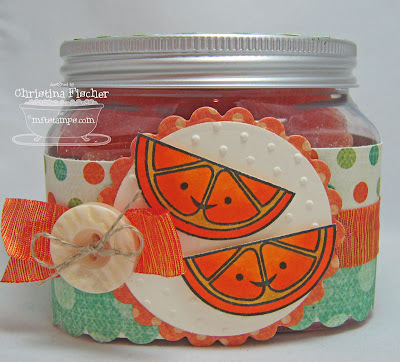 Melon Mambo cardstock and ribbon. Play along with us! Use keyword ATSDTC57 when uploading. You can see some DT challenge samples on the ATS Blog. I'll be back tomorrow with this week's My Favorite Challenge -- I hope you stop back! Thanks so much for visiting today! Hello, everyone! It's the 2oth of the month, and that means it's Celebrate MFT Day! Beginning this month, We'll celebrate with a Customer Blog Hop! You can see all the details about it HERE. Joanne is leading off the hop, so be sure to stop by and check it out! 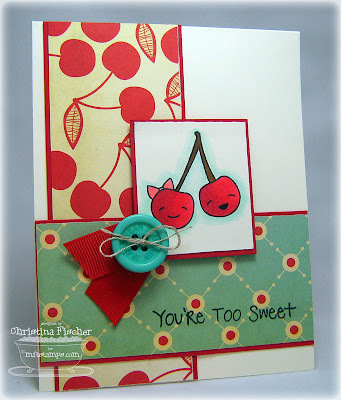 I wanted to create something fun for Celebrate MFT Day, and I had Feelin' Fruity? still out on my counter, so I made this little container. Actually, I've had this idea in my head ever since I laid eyes on this set, and I'm so glad I had a chance to make it happen! 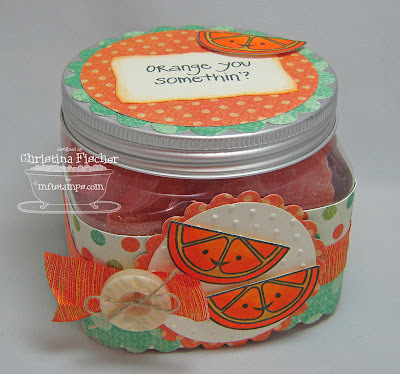 :) I filled the Perfect Packaging Jar with orange slices candy (one of my favorites!) 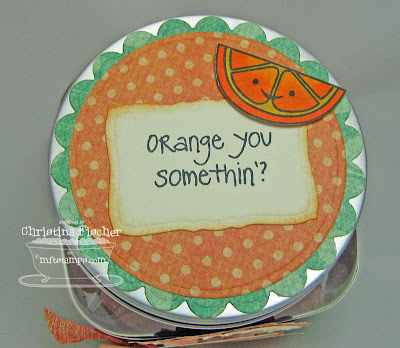 and created an orange-themed gift treat! I'm posting this kinda late -- it's been another busy day. Thanks for all the good wishes and prayers for my niece -- each day she's taking baby steps toward getting better, but she still has a long way to go. Thanks so much for stopping by -- have a fantastic night! Lookie! I stamped something! Thanks for being patient with me while I've been MIA. Let me fill you in... our 4-year-old niece Jenna has been in ICU since Tuesday. She was in septic shock because of a strep infection, and her little body has taken quite a hit. She is hooked up to a ventilator, dialysis, and MANY bags of medicine. She is now taking baby steps toward getting better, but she is still a very sick little girl. If you wouldn't mind sending up a few prayers for her, I'd really appreciate it! Anyway, Jenna's hospitalization plus a few other family things have really zapped my mojo. Today I woke up and just needed to stamp something happy. And this set makes me happy! 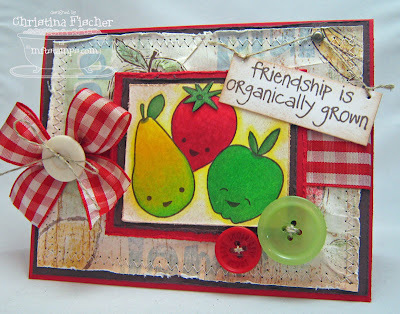 :) It's the just-released MFT set Feelin' Fruity?, illustrated by Stephanie Fizer. Although Joanne and Jody were sweet enough to tell me to take the week off, I just couldn't stay away from the My Favorite Challenge this week. It's all about texture -- crumpling, tearing, ripping, distressing, embossing -- however you can get it! I crumpled the dp into a ball and smoothed it back out. Then I machine stitched it to the cardstock. I distressed all the edges of the cardstock and paper. I did some masking when stamping the fruit images, then I colored with Copics. I sponged the Perfect Plaid Ribbon, the image panel and the sentiment with Creamy Caramel ink. The card design reminded me of an old fashioned fruit stand (maybe it was the Fruit Stand paper by Flair Design that gave me the idea! ), so I made the sentiment into a little sign. Okay, so I think this happy card just might have jumped started things for me again! Thanks so much for stopping by today -- I really do appreciate it SO much! Hello, everyone! I apologize for the lack of posting the last couple days. My niece has been very sick in the hospital, and my thoughts (and mojo) have been elsewhere! 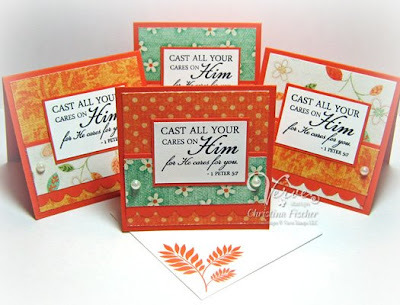 I'm hoping to get some stamping done this evening. Until then, I do have something fun to share with you! 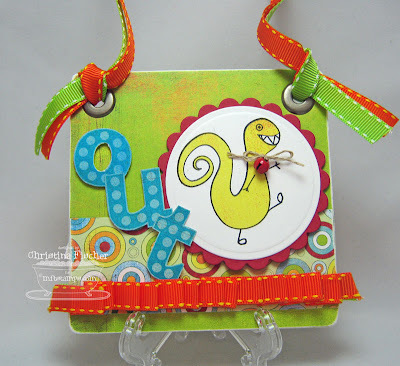 Over at All That Scraps, Christine has released her first stamp kit! It is full of adorable autumn images featuring her Sugarplums characters. It will be available for a limited time, so get it while you can! :) You can see some projects with the kit HERE on the ATS Blog. Thanks for hanging in there with me -- I hope to have something to show you tomorrow! Hi there! 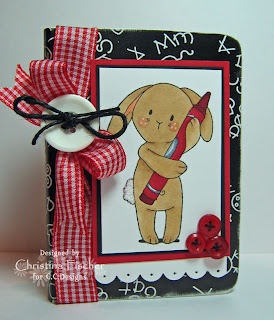 You've made it to my stop on the My Favorite Things Release Blog Hop! 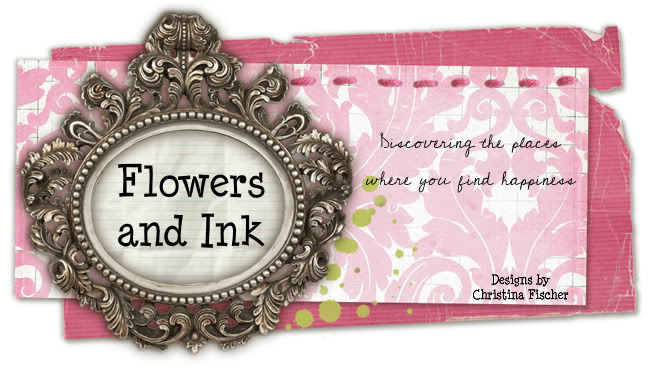 If you've just come from my friend Carole's blog, welcome! If you haven't seen all the projects so far, go back to Kim's blog and start from there! 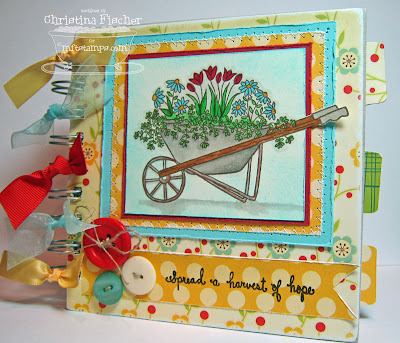 I used Spread a Harvest of Hope (illustrated by Annie LePoint) to create this garden journal and seed pack. I covered a 5x5" art journal with paper and sanded the edges. The other panels on the front were distressed, and I added some machine stitching too. I colored the image with Copics and sponged around the edge of the image panel. The ribbon is from the Summer Collection Ribbon Nest, and the buttons are from the Cup o' Buttons Summer Collection. 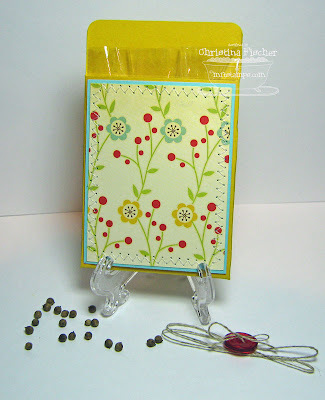 I used my gift card holder template to make the seed packet. I used the same paper as on the journal, and I did some more machine stitching. Well, you've made it through the MFT Blog Hop! I'm your last stop! Now it's time for the BLOG CANDY!! Just leave a comment here on this post for a chance to win! I'll randomly choose someone to receive a code for a free Mini Set ($9 value). 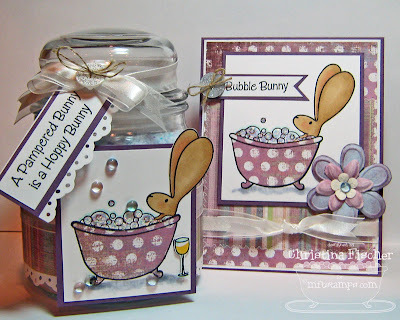 Just think -- Bubble Bunny or Spread a Harvest of Hope could be yours free! Tomorrow (Wednesday, 7/15) at 9:00 pm Eastern I'll post the winner on the MFT Member Company Forum! 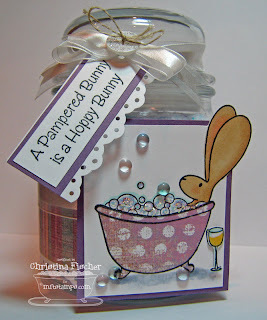 Check out this week's Bubble Bun HERE. I'll be back tomorrow night at 10 pm for the Release Blog Hop! I hope you'll stop by! Hello! Happy Sunday to you! 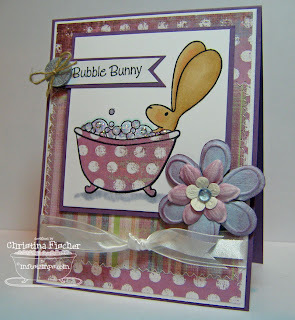 My Favorite Things is releasing three new sets this Wednesday, and here's a peek at Bubble Bunny. Seriously, this just might be the cutest Flopsey ever! :) I just had to create a little bath set, complete with homemade lavender-scented bath salts! I colored Flopsey with Copics, and I used Stardust Stickles and Dew Drops on the bubbles. I paper pieced the tub, and the buttons are from the Cup o' Buttons Spring Collection. I sponged the flowers with Perfect Plum ink. Mix together well and pour into an airtight jar. Shake once a day for about a week. Enjoy! That's all for today -- I'll have another MFTeaser for you tomorrow! Thank you so much for spending a little time with me today! It's been hot and humid for a couple days, but that didn't stop me from playing the Ways to Use It Challenge -- Christmas in July. I had been itching to ink up these new stamps from American Art Stamp, and the challenge was perfect! 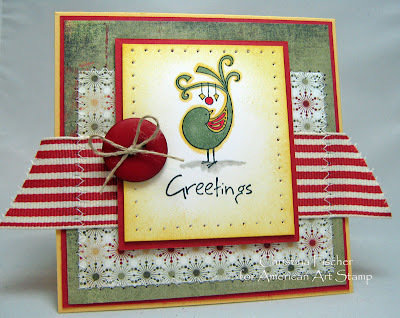 :) I paired Paisley Bird with Ornaments with a sentiment from Greetings Words. I colored with Copics and sponged the edges of the image panel. I had a little fun with the ribbon and machine stitching, and I love the way it turned out! Well, I'm going to see what my girls have planned for today! Thanks so much for stopping by today! Happy Friday, everyone! Another week has flown by! 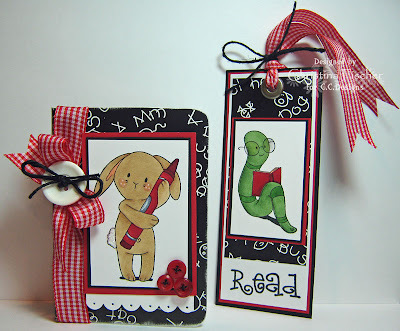 This week's My Favorite Challenge is child-themed -- use those My Favorite Things stamps to make something for a child. The challenge thread has some inspiration pieces to kick start your ideas! I used two chipboard coasters, and I covered each with the dp. Then I glued them together before inserting the Jumbo Eyelets. I paper pieced the monsters. I found these little red jingle bells in my stash, and I added them to the monsters so there would be a little noise when the door opens! Hi there! Happy Thursday to you! 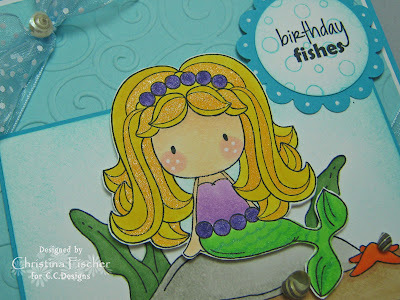 I have one last sample to show you from the recent Verve Stamps release. 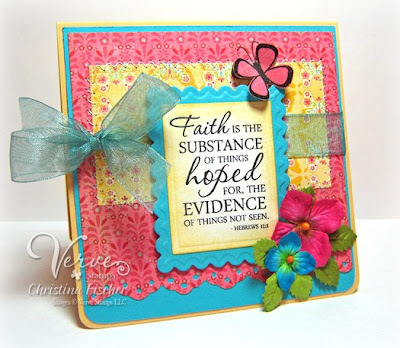 I used the new Hebrews 11:1 Plain Jane as the focal point of this card. The butterfly is from Floral Whimsy. I machine stitched around the yellow paper panel, and I sponged around the sentiment. The butterfly is cut out and popped up on a dimensional. We're expecting more rain today -- UGH! It just hasn't felt like summer! Megan has a swim meet tonight, so I hope it isn't a wash out! MFT Kits - Just Add Color! 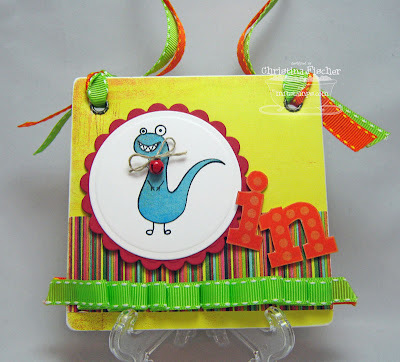 My Favorite Things is pleased and proud to introduce something fresh, fun and completely distinctive - MFT Kits! Each month, a new Kit will be revealed, complete with an exclusive, unreleased stamp set, and the items you'll need to complete a very special project(s). The set included with your MFT Kit is a brand new, unreleased set, and will not be available for a period of at least 3 months after the release of the MFT Kit containing the set. Purchase the MFT Kit between 7/8-7/14 and you will receive a discount code good for a free digi paper download (2.95 value) as well as a coupon for a future order. Thanks for stopping by today -- have a fantastic day! Happy Tuesday, everyone! 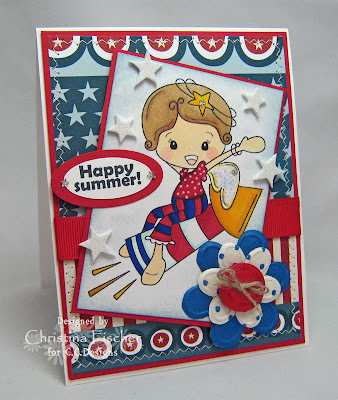 Today's project is one I made for the June Verve Stamps release, but I hadn't shared it here yet! It's a 3x3 box and notecard set made with 1 Peter 5:7. I used the Leaves Plain Jane for the envelopes. The tutorial for the 3x3 box can be found HERE at Splitcoaststampers. 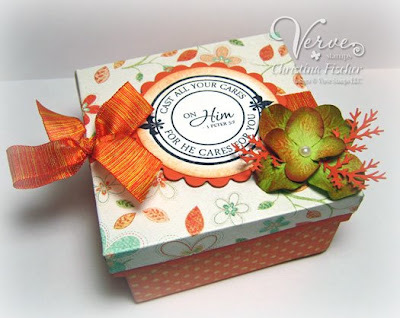 I used Bloom and Grow patterned paper on the notecards and the box. It coordinates perfectly with Tangerine Tango cardstock. I really love the way this set turned out! It is easy to make, and you could fill the box with any small gift! I hope you enjoyed the ATS Previews -- these new sets are just so much fun to play with! :) Thank you so much for visiting today! MFT turns 3 this weekend, so we are celebrating ALL month long! This weekend ONLY (July 4th and 5th), we are offering a Buy 3, Get 2 FREE promo! But since we know the new stuff is on your wish list, we are EXTENDING the 10% discount offered on the One-Click Collection and Buy It All Bundles on these sets through Sunday, July 5th as well! Thanks for visiting today -- have a great day and a wonderful weekend! Today's All That Scraps preview is of AmyR's Butterfly set. The layout is this week's Mojo Monday Sketch. 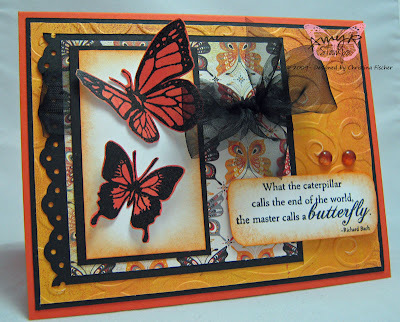 I stamped the butterflies onto the dp and heat embossed them with Black Detail EP. I cut them out and popped up the wings before adhering them to the white panel. I sponged around the image panel and the sentiment with Pumpkin Pie ink. 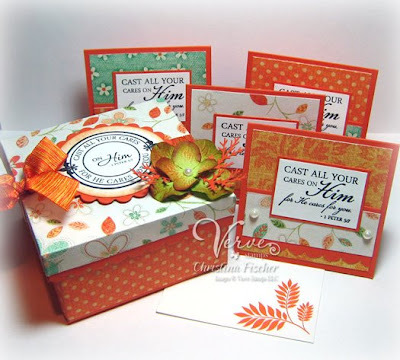 Stop by the ATS Blog to see more samples of this beautiful set! All of the new stamps will be available Monday, July 6 at 10:00 pm Eastern. That's all for today! I still have more previews to show you, so I hope you'll be back! Thanks so much for the visit! I had a total *aha! * moment with this one. I was ready to use one of the many containers I have saved in a box for just such a purpose, when I spied a pack of CDs on the counter. I was lucky enough to find the acrylic divider still in the pack, and I was in business! 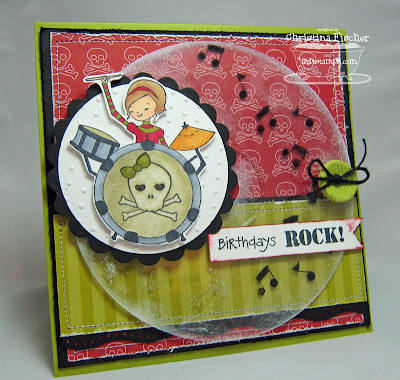 I used The Poppies for this rock-themed card. I stamped the notes in black Stazon, and I sponged white Stazon around the edges. I applied Riding Hood Red ink directly from the pad to the edges of the sentiment. That's it for today! I'll have another All That Scraps Preview for you tomorrow! Thank you for taking the time to visit -- I really do appreciate it! ATS Challenge and a Preview! This next card is a preview of the soon-to-be-released set called Chasing Butterflies. 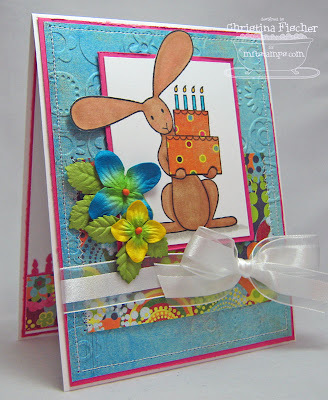 It is by a new stamp designer, Diem Pascarella. 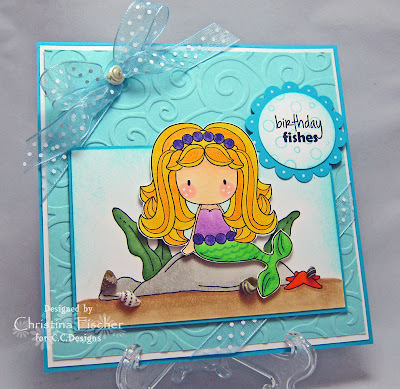 If the name sounds familiar it is because she designs the Beautiful Day Fairies for Paper Makeup Stamps. She will be illustrating animals for C.C. Designs. Welcome, Diem! Isn't this image so sweet? That's all for today! 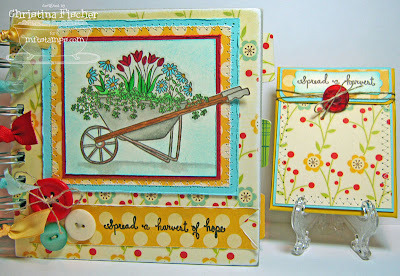 It's cool and rainy here today -- looks like a good day for stamping! Thanks so much for stopping by!